Hi, I’m Bram, 28 years and passionate about IT, developing online platforms and discovering new technologies nonstop. It's not always easy to explain my job as IT system developer in the world of remote sensing isn’t always easy. Or is it? Growing up in the 90’s and 00’s with desktop computers, floppy disks and the good old Nokia 3210, I witnessed the pace of innovation. Technology was all around and evolving faster and faster every year. Now, almost 20 years later I’m thrilled to build applications that make lives easier. From farmers and seed breeders to international dredging companies, we can truly all benefit of Earth observation data. During my childhood I have experienced the birth of many new technologies. I vividly remember discussions about making a phone call or using the internet instead, being economical with disk spaces on the floppies and the rise and fall of popular services like MSN Messenger. And now we can’t even imagine a day without our beloved smartphone offering all kinds of apps. Technology has always been a big part of my high school studies, where I took my first steps into programming. Intrigued by the fact that I was now able to build applications to make life easier, I decided to pursue my interests. I studied IT at University of Hasselt where I learned a lot about the bits and bytes of software/hardware design and implementation. By working on more complex projects, ranging from image processing to solving complex calculation problems, I quickly experienced the impact of these solutions in real-life problems. A 3 years Master in Human Computer Interaction made it complete for me as I learned to translate complex problems into user-friendly and intuitive applications. Today, this is still the most important aspect of every project in our business. As IT System Developer it’s my job to create user-friendly web applications out of more complex computer systems. I am responsible for the coordination of the design and implementation of different mostly web-based user applications. This requires the cooperation of a team of IT experts, ranging from IT infrastructure specialists to application developers, each of them providing their knowledge and expertise to the different projects. What I like the most about my job is that we are building solutions with a visible real-life impact - How cool is it to build an application that allows farmers to get information about their crops based on satellite images? 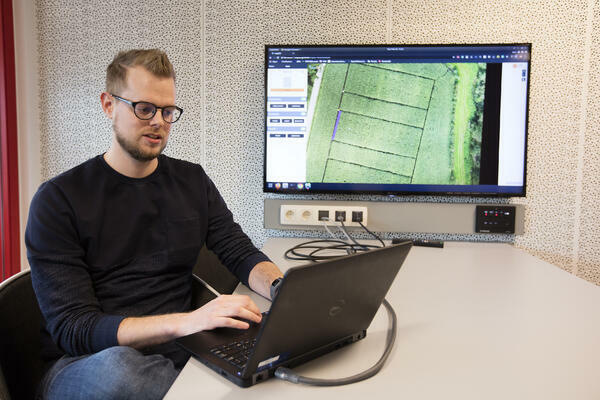 Or did you ever imagine that it is possible to detect diseases on a crop field by executing a single drone flight? Or what about looking to the water quality from the sky during dredging activities for the protection of valuable ecosystems? - I am still astonished by the information that we can extract from a single image. Another nice thing about my job or actually our team’s services is that we develop solutions to get a better look on our environmental and social challenges. Via intuitive application that can be used by different kinds of users, we help make our planet a better place. Being part of this, working closely together in cross disciplinary teams and seeing the impact of the solution, is what drives me in my daily job. Serving local farmers or international policy makers! As the impact of our solutions reaches a more global scale, most of our projects are executed in an international context. Working together with other specialist teams allows an interactive exchange of knowledge and expertise in building IT solutions in the world of Remote Sensing and Earth Observation. Working in Remote Sensing also means that we are mostly challenged with a problem that does not have an off the shelf solution. This often bring along some challenges but it also gives us the opportunity to design our own solution using the newest technologies. Keeping ourselves up-to-date with the latest trends is key in our job. Being a research institute, we have a responsibility to discover and learn new technologies, driving innovation within the team and the applications we build. So, we constantly improve our developing skills and in the meantime also create more valuable solutions. Isn’t this a nice thought to keep in mind when you leave the office at the end of the day! Share my passion? Join our team! But enough about me and my passion for my job in the wonderful world of remote sensing. The amount of data to be processed to get this information will only grow larger and get more complex, increasing the need to build IT systems to offer comprehensible information to our users worldwide. Do you also love to create user-friendly applications in support of services and users worldwide? Why don’t you join our team? We’re looking for skilled and enthusiastic IT developers who are eager to develop remote sensing products and services. Discover more about the open vacancy and join our world where the sky is not the limit.